Monday – AUS – Building Approvals dropped 8.4% in December, against expectations for a small rebound following a 9.8% fall in November. Monday – US – Durable Goods Orders were weaker than expected in November, down 0.6%, below expectations for a 0.2% rise. 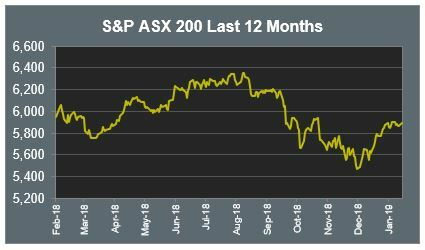 The Australian sharemarket rose 0.5% yesterday, led by the Utilities and Energy sectors, up 1.6% and 1.3% respectively. The Financials sector was also stronger, gaining 1.0%, as the big four banks closed between 0.7% and 1.2% higher. Boral (BLD) was weaker after its 1H19 guidance underwhelmed amid adverse Australian weather, construction delays, and slowing volumes in the US. BLD closed down 7.9%. Healthscope (HSO) provided its 1H19 trading update and reaffirmed its FY19 guidance for Hospitals Operating EBITDA to grow over 10%. The update revealed 1H19 Hospitals Revenue was $1.1bn and Hospitals EBITDA was $186m. HSO closed at $2.46. The Australian futures market points to a 0.61% rise today, being driven by stronger overseas markets. European sharemarkets were mixed on Monday, with banks the biggest drag. The broad based STOXX Europe 600 rose 0.1%, the UK FTSE 100 gained 0.2% and the German DAX was flat. US sharemarkets rose overnight. The Dow Jones and S&P 500 both rose 0.7% and the NASDAQ climbed 1.2%. Gilead Sciences (GILD) reported Q4 earnings, with total revenue of US$5.8bn down from US$5.9bn for the previous corresponding quarter. GILD announced an increase in their quarterly dividend up 10.5% to US$0.63. GILD closed flat for the session at US$70.05. Technology companies were strong performers; Alphabet was up 2.0%, Facebook rose 2.1%, Apple gained 2.8%, Microsoft lifted 2.9% and Netflix climbed 3.4%. 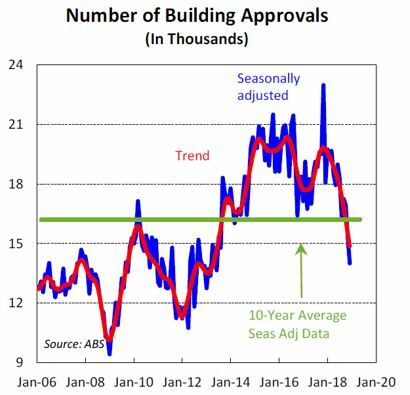 A picture paints a thousand words and the graph below does exactly that for Australia’s residential building activity. The drop in building approvals of 8.4% in December, followed a 9.8% fall in November. Over the 2018 calendar year, the total decline was 22.5%, down over 39% from the peak of November 2017. The weakness was broad based across all sectors, however private sector “other” dwelling approvals, which are mostly apartments, dropped almost 19% to the lowest number since 2012. Residential building activity has been a key driver of Australia’s post GFC/Mining boom economy, and helped cushion unemployment during this period. A wide range of skills are engaged in the residential construction industry and these latest leading indicators suggest significant downside risks to the job market, on top of being a general drag on the domestic economy.